Harbor Freight shop crane assembly instructions videoMINDLESS BORING: 1 and 2 ton models, The Harbor Freight foldable shop crane is a heavy duty cherry picker in the shop. 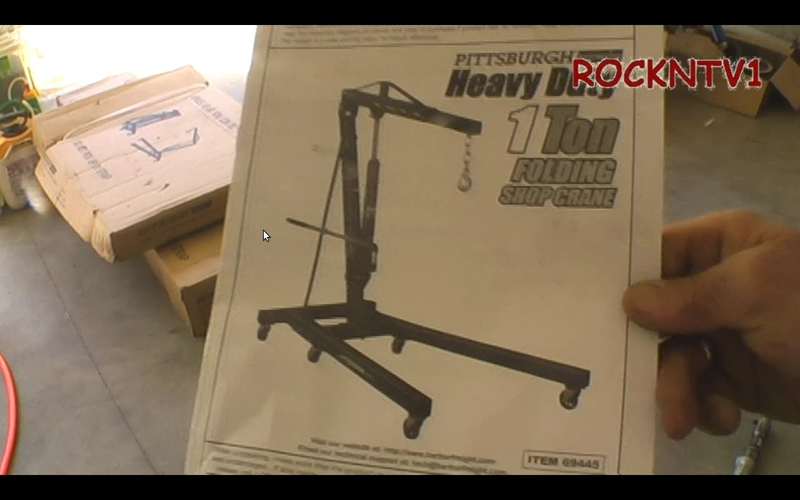 Built of steel and cast iron, the Harbor Freight by Pittsburgh automotive, 1 ton shop crane # 69445 with discount for 99$ has but one job to do in my home machine shop, that is lifting my new hf 40939 mill onto its stand. While I hardly have room in the garage for this foldable crane, I justified its purchase by dreaming up yet another lifting chore for the crane to do, more on that later. The 69445 heavy duty crane assembly came in 2 boxes and weight near 175lbs. Putting the crane together is pretty straight forward with the pictorial instruction sheet and numbered and labelled hardware. The time to assemble the folding shop crane is approximately 45min using air tools. The Pittsburgh automotive is rated at 1 ton lifting capacity at the shortest reach and 500lbs at the longest extension of the crane lifting boom, nearing 8 feet. The 69445 shop crane seems well built and has a 3 ton hydraulic ram jack. The cast iron caster wheels roll nicely on the concrete floor and made moving my mill much quicker then the assembly time of the crane itself. Most people wont be buying this shop crane to move machine tools around,but they should be pleased with this "cherry picker" for pulling car and light truck engines, although the 2 ton model might be more suitable for the later.